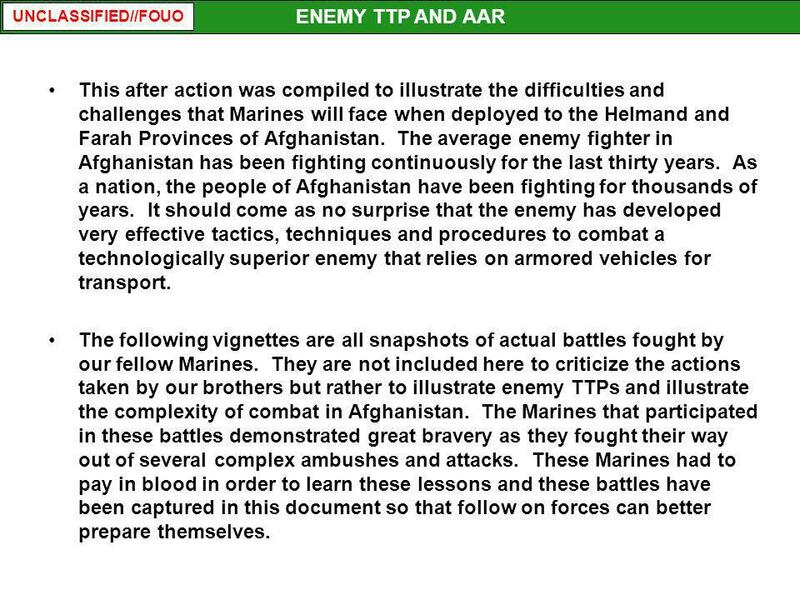 2 ENEMY TTP AND AAR This after action was compiled to illustrate the difficulties and challenges that Marines will face when deployed to the Helmand and Farah Provinces of Afghanistan. The average enemy fighter in Afghanistan has been fighting continuously for the last thirty years. As a nation, the people of Afghanistan have been fighting for thousands of years. It should come as no surprise that the enemy has developed very effective tactics, techniques and procedures to combat a technologically superior enemy that relies on armored vehicles for transport. The following vignettes are all snapshots of actual battles fought by our fellow Marines. They are not included here to criticize the actions taken by our brothers but rather to illustrate enemy TTPs and illustrate the complexity of combat in Afghanistan. The Marines that participated in these battles demonstrated great bravery as they fought their way out of several complex ambushes and attacks. These Marines had to pay in blood in order to learn these lessons and these battles have been captured in this document so that follow on forces can better prepare themselves. 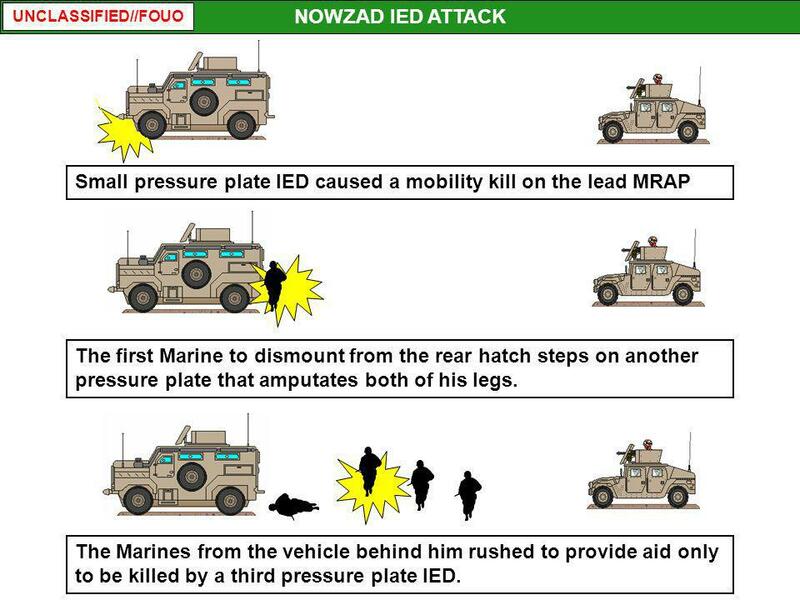 3 NOWZAD IED ATTACK Small pressure plate IED caused a mobility kill on the lead MRAP The first Marine to dismount from the rear hatch steps on another pressure plate that amputates both of his legs. The Marines from the vehicle behind him rushed to provide aid only to be killed by a third pressure plate IED. The enemy has been ambushing logistics convoys in mountain passes for a long time and it is no different in the Helmand and Farah Provinces. The enemy has a tendency to reuse successful IED and ambush sites and will use sites that were utilized in the Soviet War. This attack was conducted numerous times during this deployment from these same two mountains. There were many occasions when these attacks were initiated by an IED strike. The restrictive terrain forces convoys to take the pass. 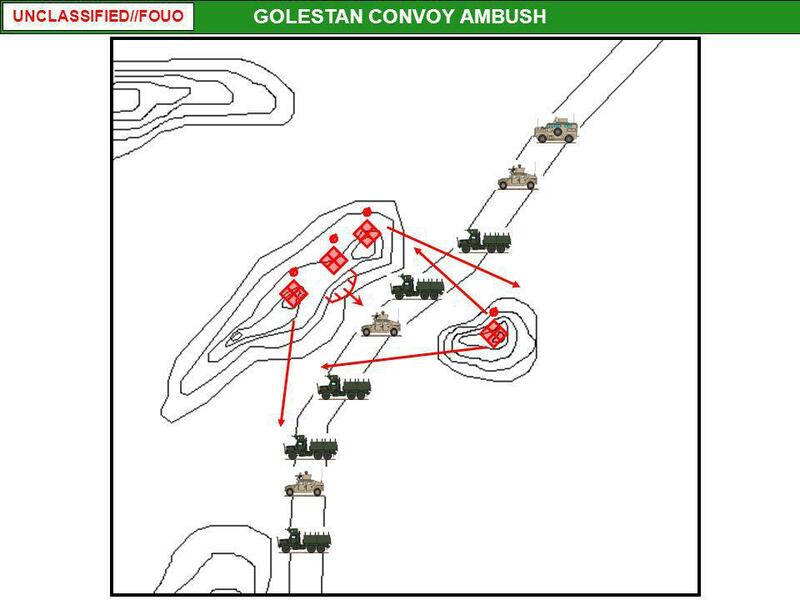 The majority of attacks in this area have been against logistics convoys. The enemy is very skilled at identifying different friendly units. They can distinguish between Army, Marine Corps and SOF units. 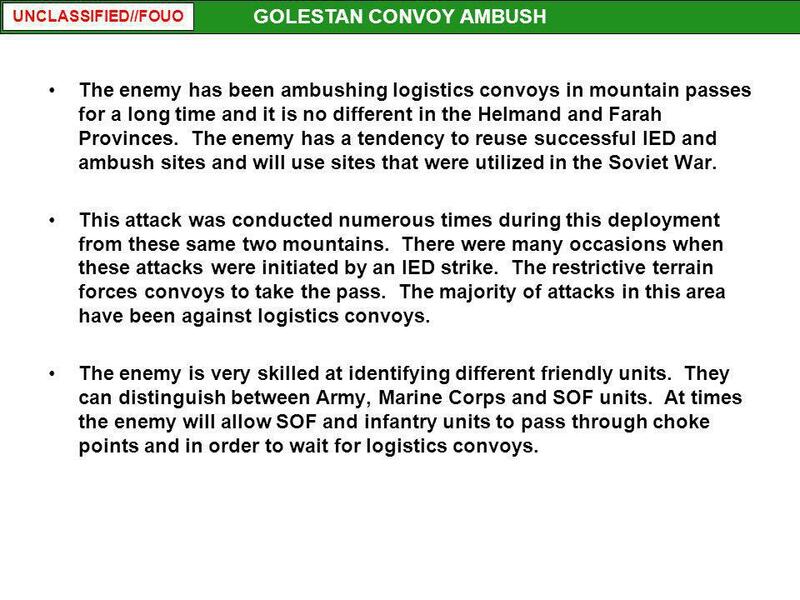 At times the enemy will allow SOF and infantry units to pass through choke points and in order to wait for logistics convoys. Patrol is engaged by an enemy fighter who runs further into the town. Enemy attacks the patrol from the rear and drives them into a fire sack ambush in a dead end. 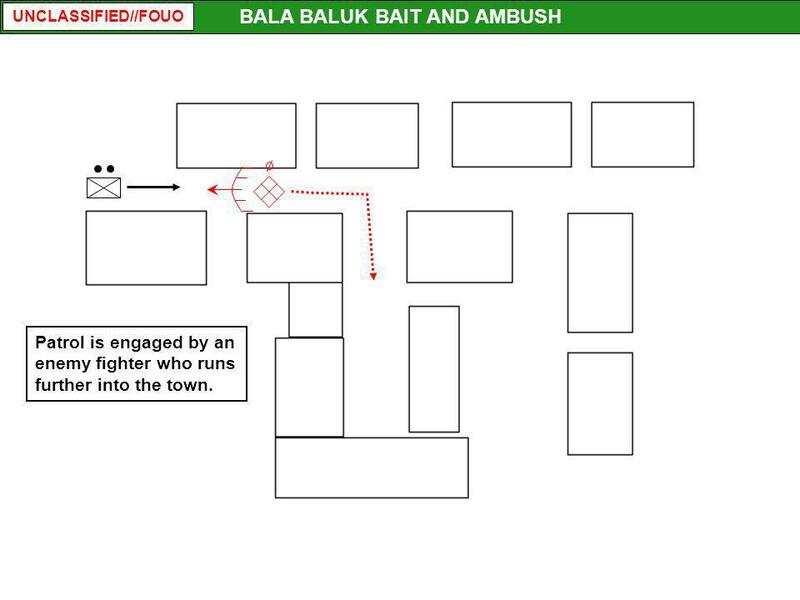 The bait and ambush attack is one of the most common ambush techniques used by the enemy. The enemy is very observant and has noticed how aggressive Marines are compared to other coalition forces. They have use this to their advantage on several occasions and have drawn Marines into complex ambushes with catastrophic results. 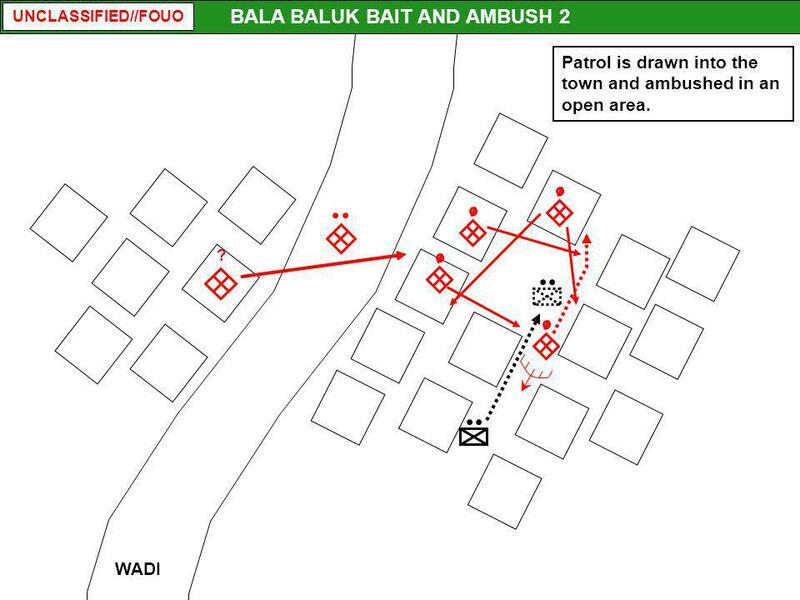 In this scenario a platoon minus was patrolling the town when they were engaged with sporadic small arms fire from a distance. They returned fire and were moving further into the town when they were engaged by a single enemy fighter who fired on the platoon and broke contact. The platoon chased the fighter through the town when they suddenly found themselves in a dead end. The enemy attacked the platoon from the rear and pushed them further into the dead end. The enemy had driven the platoon into a fire sack and they ambushed the platoon from the roof tops. This continued until aviation assets came over head and broke the ambush. A platoon minus was patrolling through the town when they were attacked by a small group of Taliban fighters who immediately fled further into the town. The platoon gave chase through the town when they passed through an open area and were caught in an L shaped ambush. The enemy fired on the platoon from the rooftops and from loop holes dug into the mud compound walls. The platoon took what cover they could, but was not able to maneuver out of the kill zone. The mud walls of the Afghani houses are very resistant to heavy machineguns and small arms fire and provide excellent cover for enemy fighters. 50 cal, MK 19 and even 20mm Vulcan will not penetrate the 18 inch thick walls. Once the platoon was fixed by the enemy ambush, the enemy reinforced the ambush site with fighters from the town to the west. The attack continued until aviation assets arrived on station and broke the ambush. A platoon was conducting a mounted patrol in an area known for harboring a large number of enemy forces when they were ambushed by a enemy platoon. The enemy destroyed the lead and rear vehicles and trapped the platoon in the kill zone. The road in this area is bordered by deep drainage ditches that prevented the platoon from turning around in place. In addition, the local houses are constructed right next to the road and provide another barrier. The platoon was unable to turn around or drive past their downed vehicles. The enemy proceeded to attack the platoon with RPG and machinegun fire from loopholes in buildings and from roof tops for several hours. 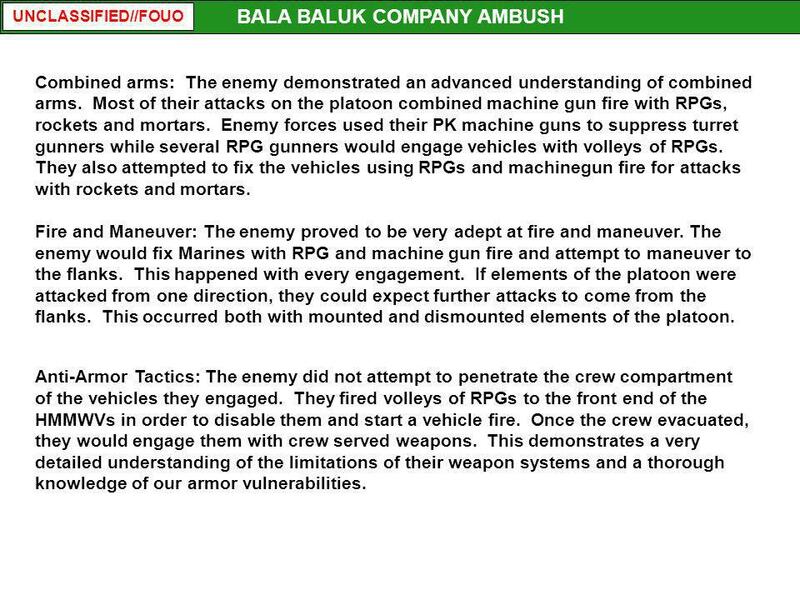 The enemy coordinated their RPG fire to strike the same location on the vehicles and used repeated RPG strikes to penetrate the armor on the MRAPs and HMMWVs resulting in numerous coalition forces casualties. The platoon returned fire but they were unable to penetrate the mud walls and were unable to effectively suppress the enemy. The enemy utilized a tree line to mask their movement and make it difficult to accurately return fire. This is a TTP that they have used in several engagements. The platoon conducted a raid on an isolated enemy stronghold. The enemy maintains a defense line 25 kilometers south of this stronghold to in order to control the valley. The platoon infiltrated past this defensive line to the stronghold under the cover of darkness. The town evacuated all of the women and children before the attack. This has been a good indicator of enemy activity but does not guarantee attacks or ambushes. 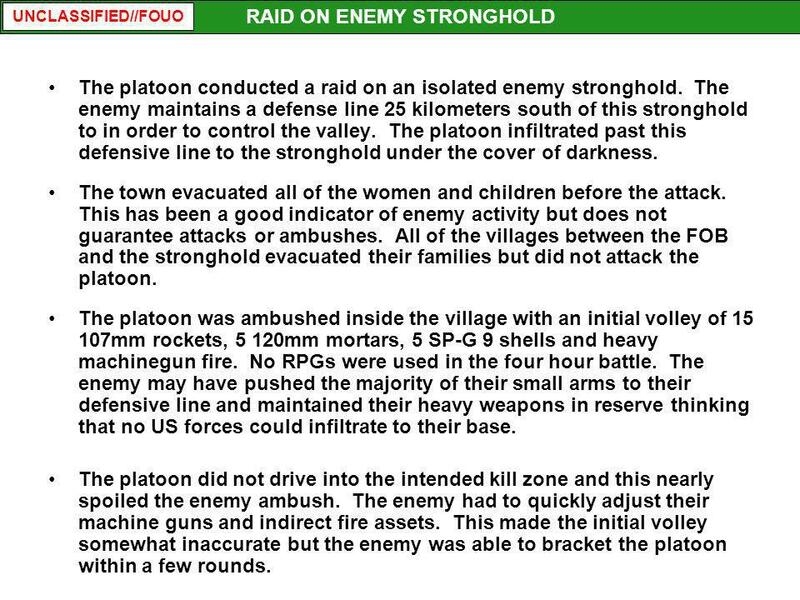 All of the villages between the FOB and the stronghold evacuated their families but did not attack the platoon. The platoon was ambushed inside the village with an initial volley of mm rockets, 5 120mm mortars, 5 SP-G 9 shells and heavy machinegun fire. No RPGs were used in the four hour battle. The enemy may have pushed the majority of their small arms to their defensive line and maintained their heavy weapons in reserve thinking that no US forces could infiltrate to their base. The platoon did not drive into the intended kill zone and this nearly spoiled the enemy ambush. The enemy had to quickly adjust their machine guns and indirect fire assets. This made the initial volley somewhat inaccurate but the enemy was able to bracket the platoon within a few rounds. The enemy attempted several flanking attacks and called for reinforcements from a village to the North. The enemy attacked the platoon with rockets from the village and the mountains for the duration of the attack. 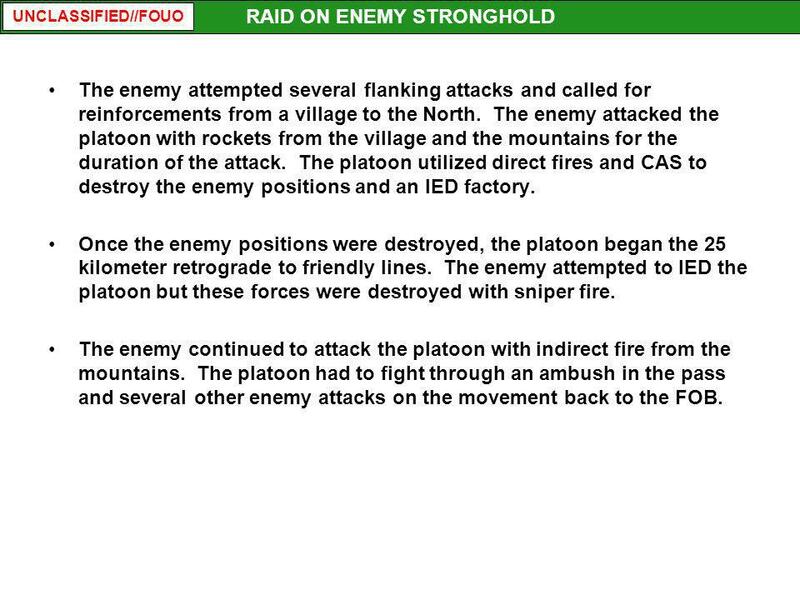 The platoon utilized direct fires and CAS to destroy the enemy positions and an IED factory. Once the enemy positions were destroyed, the platoon began the 25 kilometer retrograde to friendly lines. 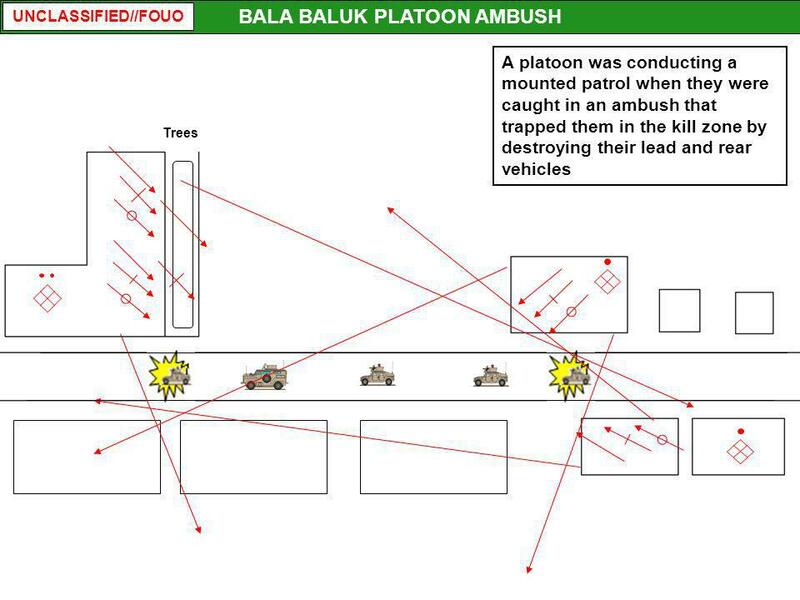 The enemy attempted to IED the platoon but these forces were destroyed with sniper fire. The enemy continued to attack the platoon with indirect fire from the mountains. The platoon had to fight through an ambush in the pass and several other enemy attacks on the movement back to the FOB. 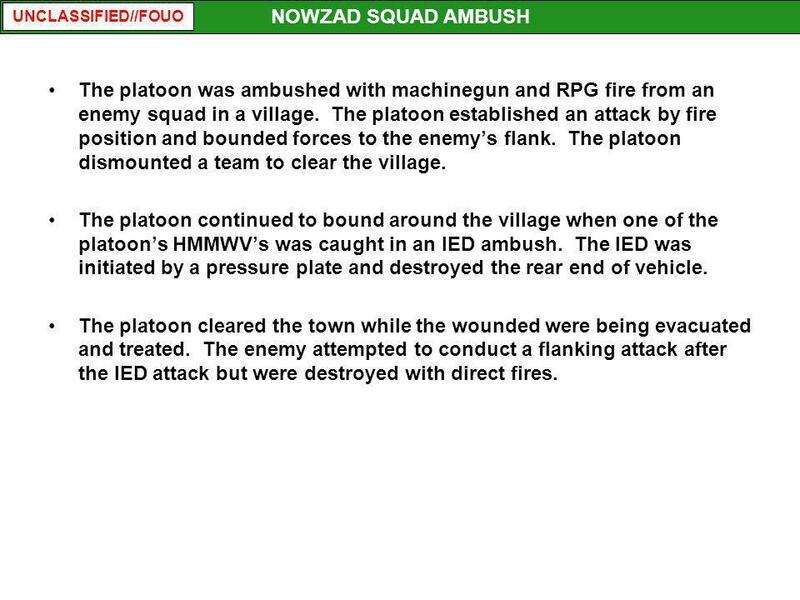 19 NOWZAD SQUAD AMBUSH The platoon was ambushed with machinegun and RPG fire from an enemy squad in a village. 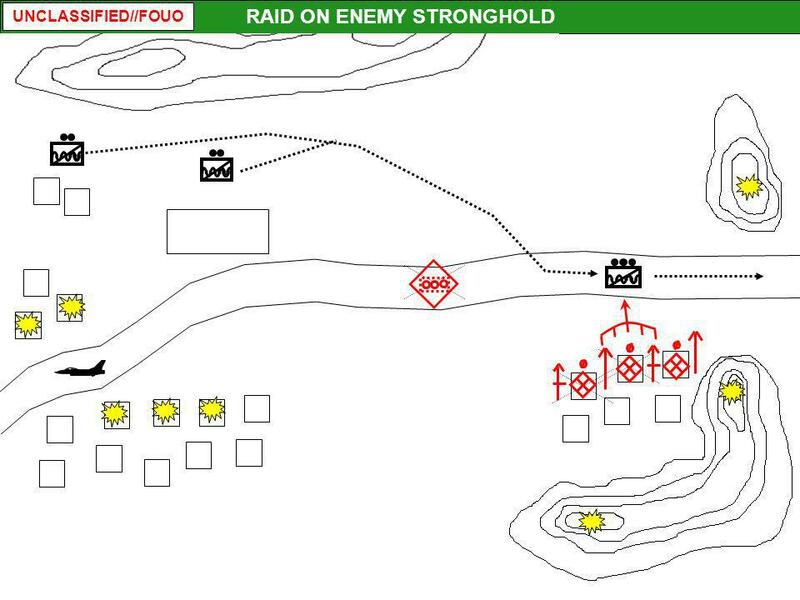 The platoon established an attack by fire position and bounded forces to the enemy’s flank. The platoon dismounted a team to clear the village. The platoon continued to bound around the village when one of the platoon’s HMMWV’s was caught in an IED ambush. The IED was initiated by a pressure plate and destroyed the rear end of vehicle. The platoon cleared the town while the wounded were being evacuated and treated. 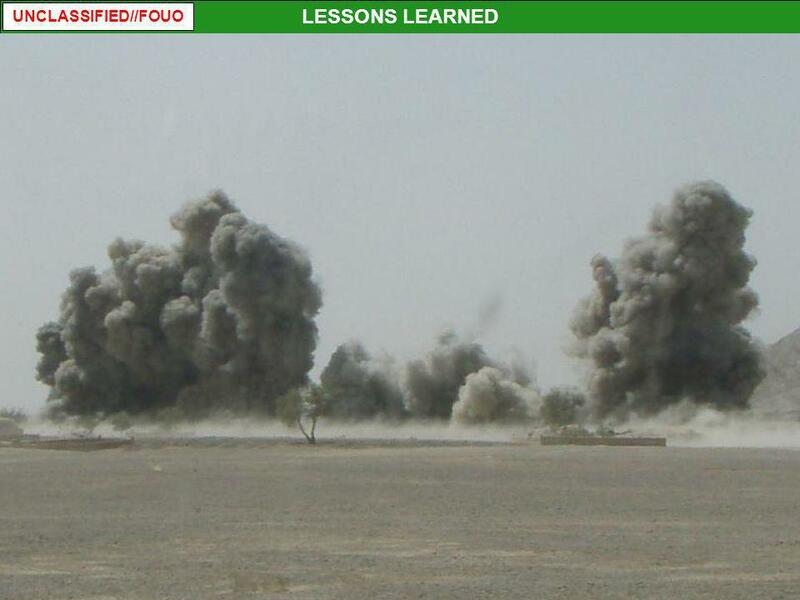 The enemy attempted to conduct a flanking attack after the IED attack but were destroyed with direct fires. 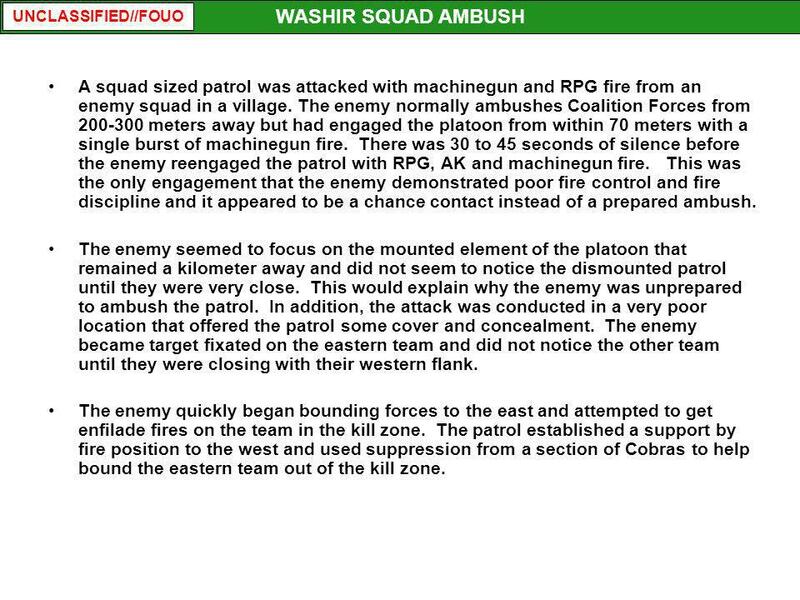 21 WASHIR SQUAD AMBUSH A squad sized patrol was attacked with machinegun and RPG fire from an enemy squad in a village. 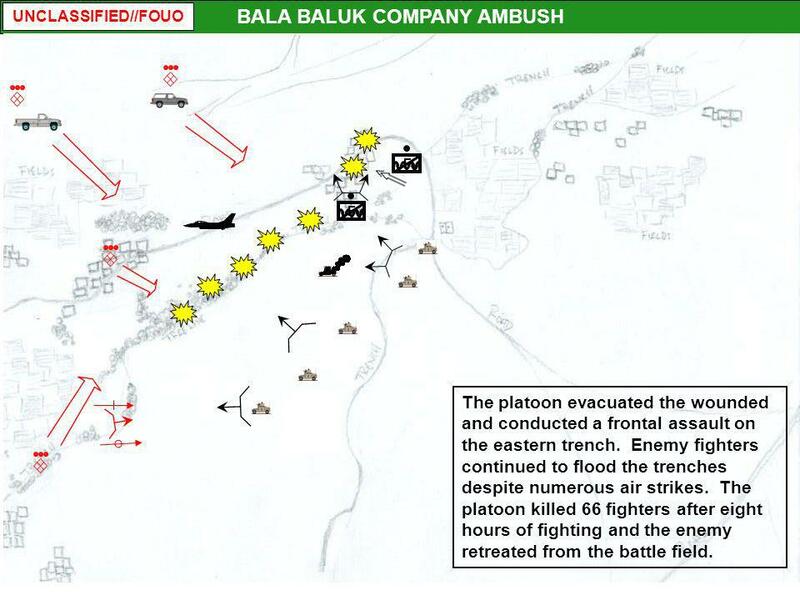 The enemy normally ambushes Coalition Forces from meters away but had engaged the platoon from within 70 meters with a single burst of machinegun fire. There was 30 to 45 seconds of silence before the enemy reengaged the patrol with RPG, AK and machinegun fire. 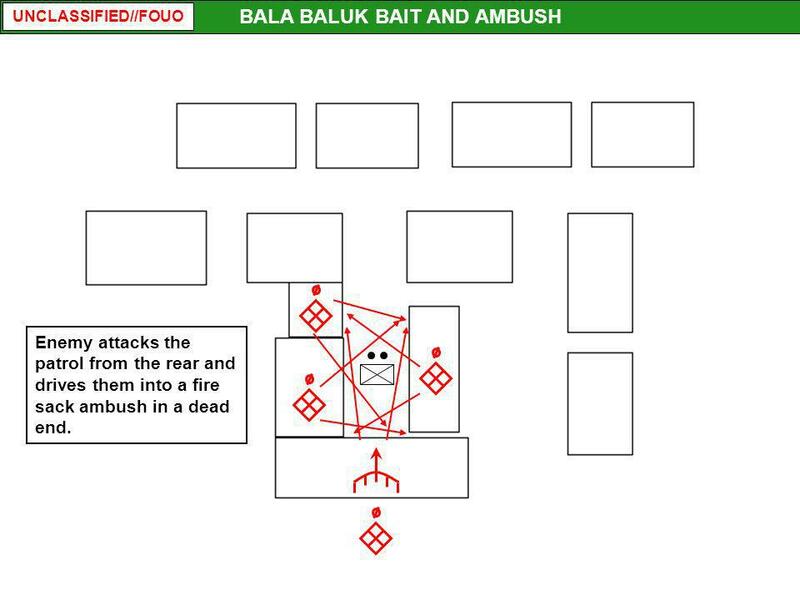 This was the only engagement that the enemy demonstrated poor fire control and fire discipline and it appeared to be a chance contact instead of a prepared ambush. The enemy seemed to focus on the mounted element of the platoon that remained a kilometer away and did not seem to notice the dismounted patrol until they were very close. This would explain why the enemy was unprepared to ambush the patrol. In addition, the attack was conducted in a very poor location that offered the patrol some cover and concealment. The enemy became target fixated on the eastern team and did not notice the other team until they were closing with their western flank. The enemy quickly began bounding forces to the east and attempted to get enfilade fires on the team in the kill zone. The patrol established a support by fire position to the west and used suppression from a section of Cobras to help bound the eastern team out of the kill zone. 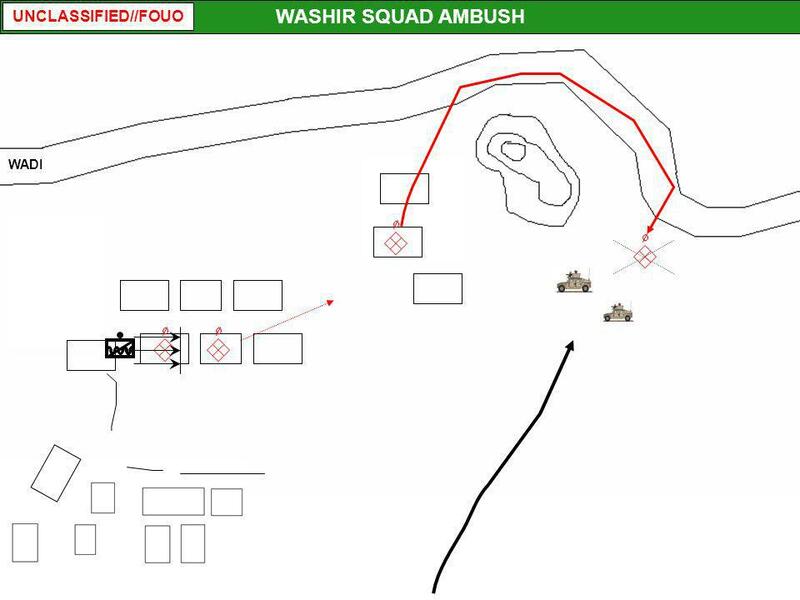 23 WASHIR SQUAD AMBUSH The platoon maneuvered two HMMWVs to the east in order to defend against a possible flanking attack. The enemy has attempted to flank the platoon during every engagement during this deployment. 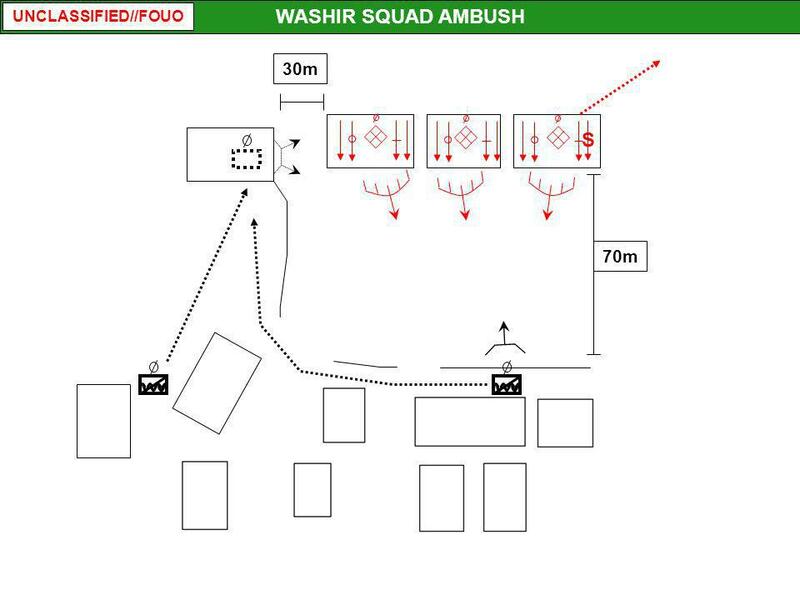 The two HMMWVs encountered an enemy fire team moving through a wadi in order to flank the dismounted patrol. The enemy was not expecting to encounter any resistance near the wadi and was quickly destroyed. The enemy has proven to be very adept at destroying armored vehicles and as a result the platoon has had to be careful with their HMMWVs. 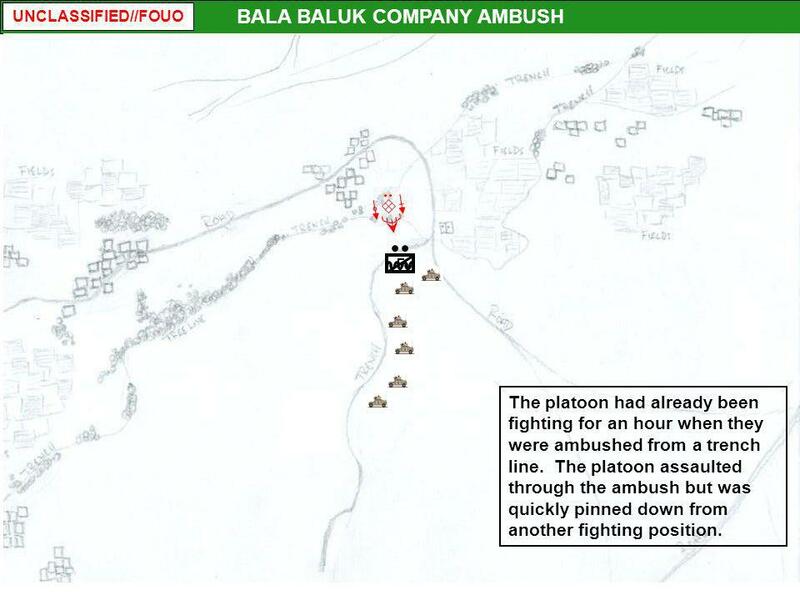 In this incident the platoon established a vehicle strongpoint a kilometer away from the village in order to prevent them from being attacked by RPGs. The platoon did not bring vehicles into the town until they were needed and once they had defeated the flanking attack they were moved back a safe distance from the town. The enemy has repeatedly demonstrated a masterful ability to utilize terrain in support of their attacks. They were able to mask their movement to the east by using the defilade of the wadi to the north of the town. They would not have been discovered if the platoon did not intercept their attack. 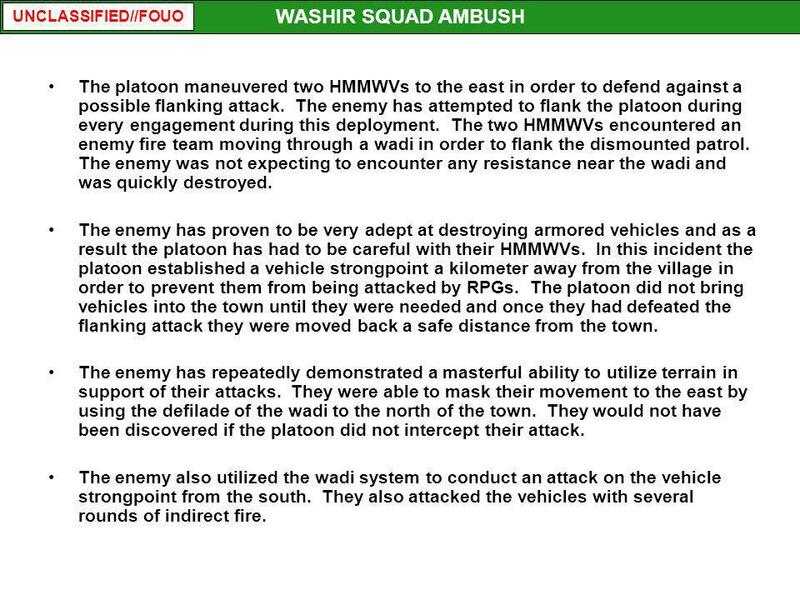 The enemy also utilized the wadi system to conduct an attack on the vehicle strongpoint from the south. They also attacked the vehicles with several rounds of indirect fire. F The platoon had already been fighting for an hour when they were ambushed from a trench line. The platoon assaulted through the ambush but was quickly pinned down from another fighting position. 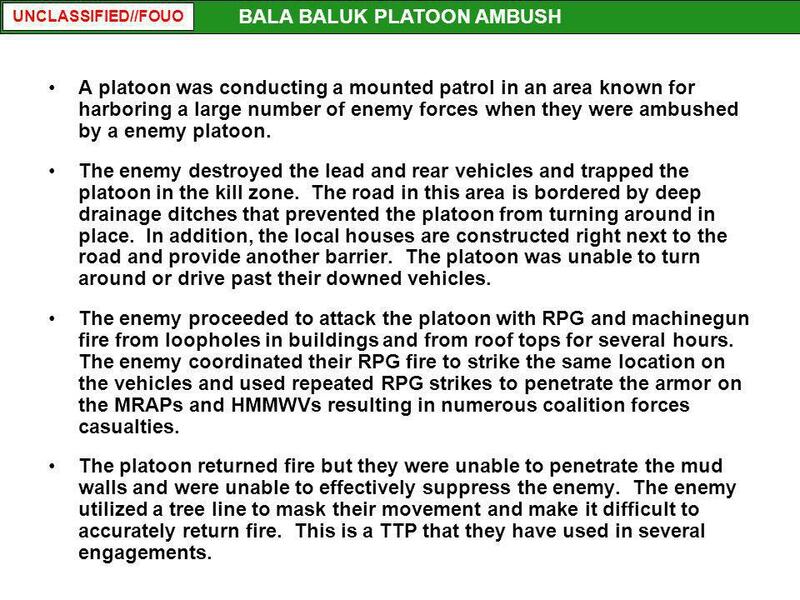 F Two vehicles were attacked with volleys of RPGs when they established a support by fire position. At this point the enemy massed to over 250 fighters. The platoon was engaged by PK machineguns and over 100 RPGs. The platoon maneuvered two HMMWVs to the west in order to establish a support by fire position. The enemy ambushed this element with RPG and machinegun fire. They suppressed the turret gunners with their PK machineguns and fired volleys of RPGs at the hood of one of the vehicles. The hood caught fire from the RPG blasts which in turn ignited the rest of the HMMWV. The enemy waited for the crew to dismount and then engaged the dismounts with heavy grazing fire from the PK machineguns. 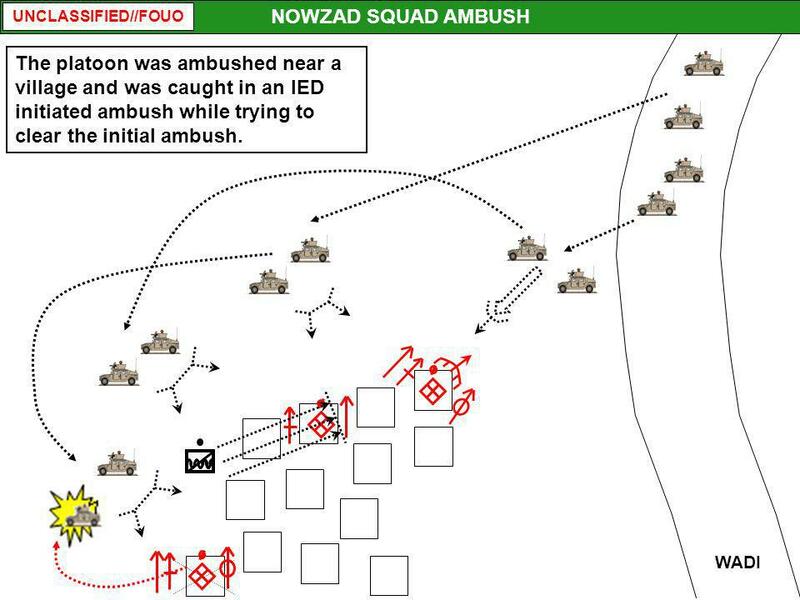 The enemy who attacked the vehicles were within range of the dismounts from the initial ambush but did not participate. The enemy is familiar with our tactics and knew that we would attempt to establish a support by fire position. This is not the only engagement where the enemy has demonstrated an advanced understanding of our tactics. 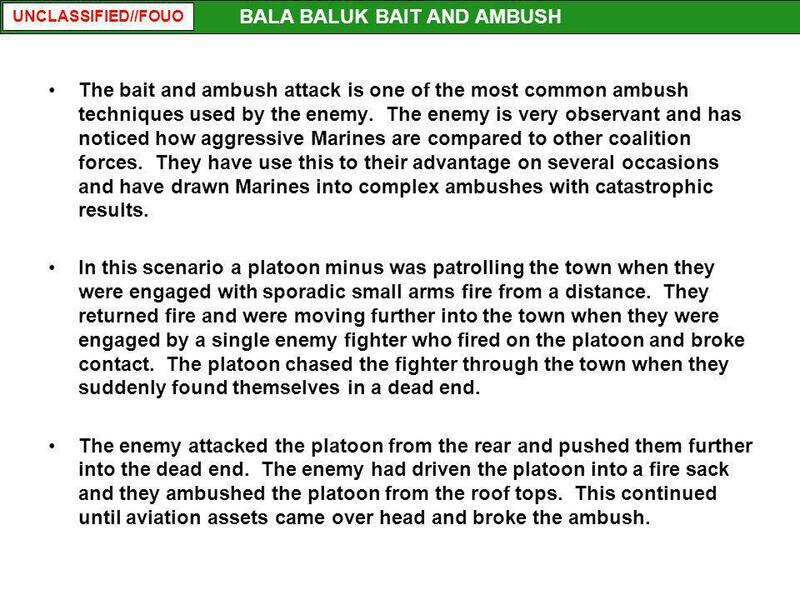 Another vehicle drove into the kill zone in order to recover the Marines from the downed vehicle but they were also ambushed in a similar manner. The RPGs struck the vehicle but did not ignite the hood. The vehicle remained in the kill zone and suppressed the seven or eight fighting positions in the tree line. The platoon was able to get F-15s overhead after twenty minutes of intense fighting and used this suppression to recover the Marines from the kill zone. The platoon pulled back several hundred meters to a defendable position in order to regroup and treat the wounded. The platoon dismounted two teams to assault the eastern trench while the mounted element of the platoon established an attack by fire position across from the western trench. F F The platoon evacuated the wounded and conducted a frontal assault on the eastern trench. Enemy fighters continued to flood the trenches despite numerous air strikes. The platoon killed 66 fighters after eight hours of fighting and the enemy retreated from the battle field. The enemy focused nearly all of their attention and fires on the platoon’s vehicles. The platoon utilized Close Air Support to suppress the enemy while the dismounted element quickly closed with the trench system and assaulted the eastern trench. The enemy did not seem to notice the dismounted element until the dismounts were within hand grenade range and had generated a great deal of momentum. 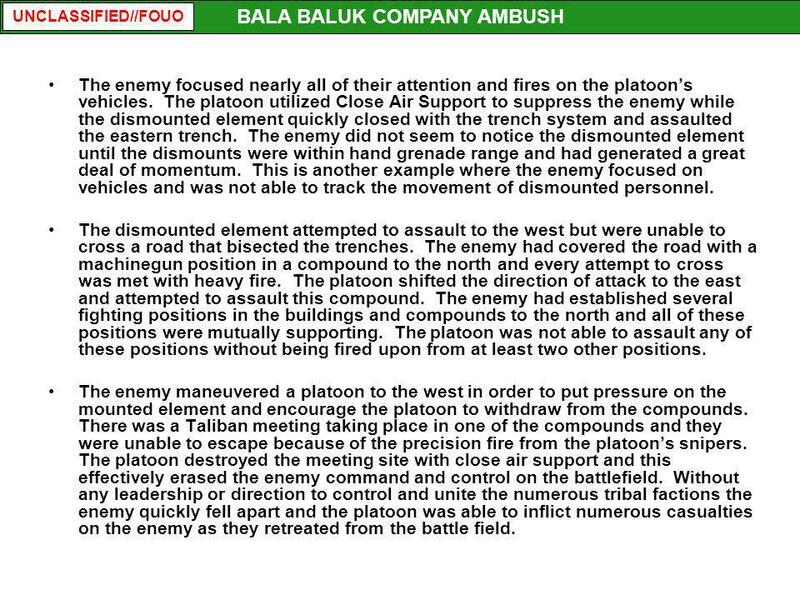 This is another example where the enemy focused on vehicles and was not able to track the movement of dismounted personnel. The dismounted element attempted to assault to the west but were unable to cross a road that bisected the trenches. The enemy had covered the road with a machinegun position in a compound to the north and every attempt to cross was met with heavy fire. 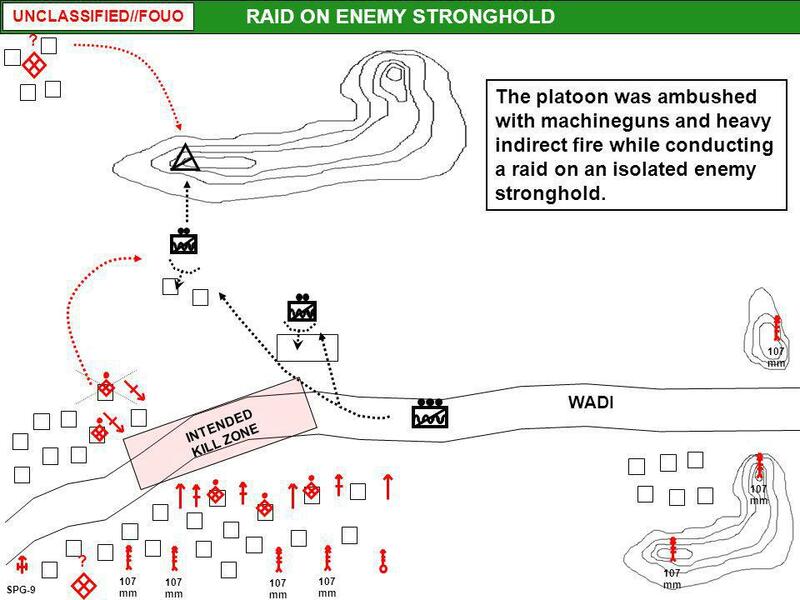 The platoon shifted the direction of attack to the east and attempted to assault this compound. The enemy had established several fighting positions in the buildings and compounds to the north and all of these positions were mutually supporting. The platoon was not able to assault any of these positions without being fired upon from at least two other positions. 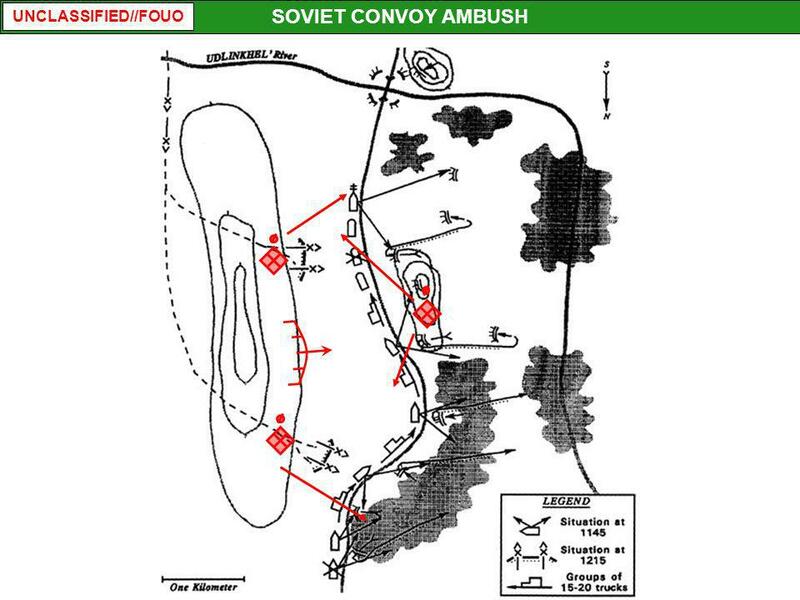 The enemy maneuvered a platoon to the west in order to put pressure on the mounted element and encourage the platoon to withdraw from the compounds. 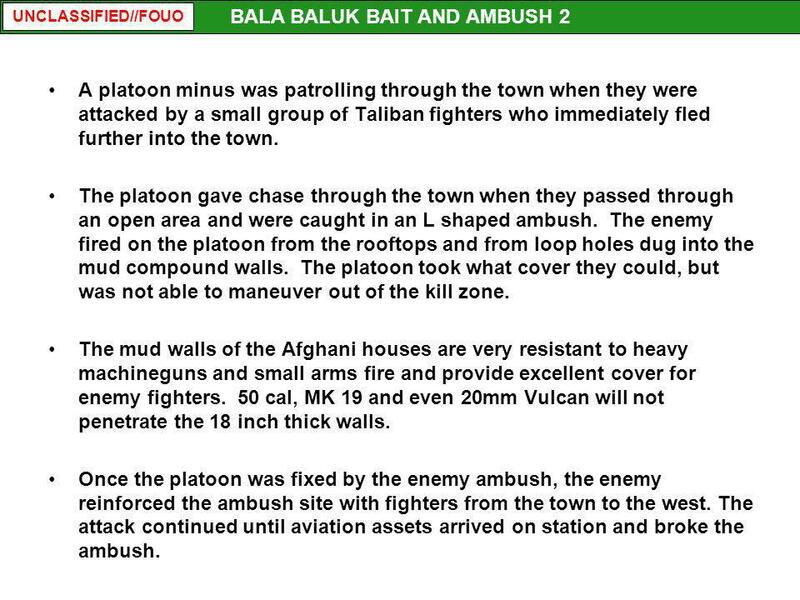 There was a Taliban meeting taking place in one of the compounds and they were unable to escape because of the precision fire from the platoon’s snipers. The platoon destroyed the meeting site with close air support and this effectively erased the enemy command and control on the battlefield. Without any leadership or direction to control and unite the numerous tribal factions the enemy quickly fell apart and the platoon was able to inflict numerous casualties on the enemy as they retreated from the battle field. 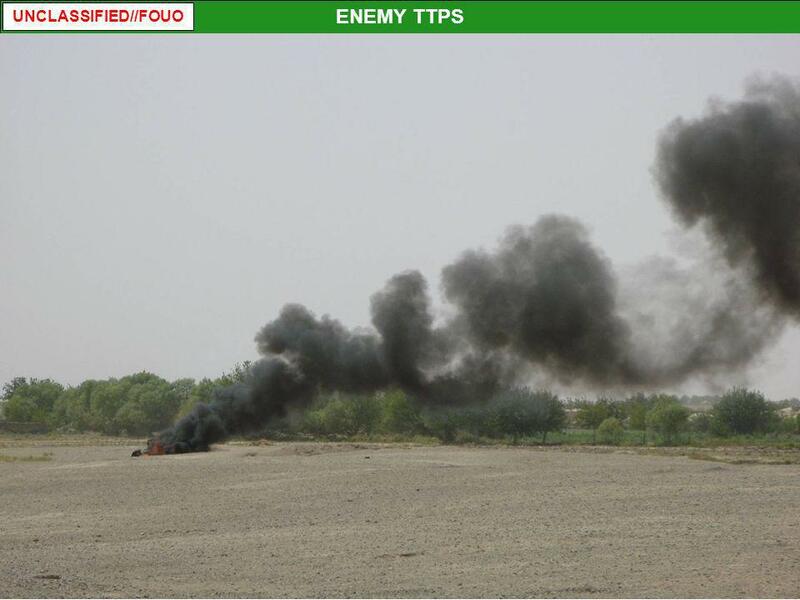 30 ENEMY TTPS Fire Control: Enemy forces have demonstrated a high level of fire control in numerous engagements. They have shifted and focused their fires on what they perceived to be the greatest threat. Ambushes have generally been initiated with bursts of machinegun fire followed by volleys of RPGs. The beaten zone of the RPGs have been within six inches to a foot. This shows a very developed system of fire control and points to a section leader controlling these fires. The complexity and size of some of these ambushes point to a platoon and company level command structure. Interlocking fields of fire: The enemy did an excellent job of placing fighting positions in locations where they could mutually support each other. As elements of the platoon attacked one position, they would be engaged from multiple firing positions. Several times during the engagement elements of the platoon would be pinned down from accurate fire coming from several directions until other elements could maneuver to destroy those positions. RPG Volley Fire: Almost every time the enemy attacked the armored vehicles, the enemy attacked with volleys of 2-3 RPGs. This demonstrated a high amount of coordination and discipline. Often times these attacks came from multiple firing positions. 31 ENEMY TTPS Ambushes: The enemy normally did not actively seek to engage the platoon in open ground but waited for the platoon to come within the effective range of their weapon systems. They engaged dismounted troops at meters away with small arms and engaged vehicles from with RPGs and PK machineguns. The enemy utilized rockets and mortars to attack the platoon outside of 300 meters. The enemy continued to ambush the platoon even during engagements. They have maneuvered on the platoon but generally preferred to keep the platoon at a distance and move through defilade to attack the flanks. They have fought to the death when fixed by fires. Fire Discipline: The enemy has been extremely disciplined with their fire and only engaged targets who were within the effective range of their weapon systems. 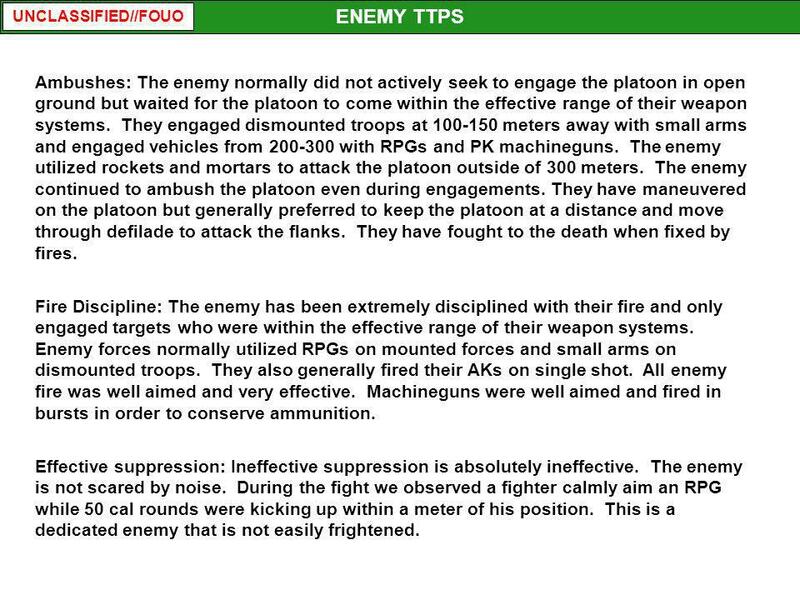 Enemy forces normally utilized RPGs on mounted forces and small arms on dismounted troops. They also generally fired their AKs on single shot. All enemy fire was well aimed and very effective. Machineguns were well aimed and fired in bursts in order to conserve ammunition. Effective suppression: Ineffective suppression is absolutely ineffective. The enemy is not scared by noise. During the fight we observed a fighter calmly aim an RPG while 50 cal rounds were kicking up within a meter of his position. This is a dedicated enemy that is not easily frightened. Combined arms: The enemy demonstrated an advanced understanding of combined arms. Most of their attacks on the platoon combined machine gun fire with RPGs, rockets and mortars. Enemy forces used their PK machine guns to suppress turret gunners while several RPG gunners would engage vehicles with volleys of RPGs. They also attempted to fix the vehicles using RPGs and machinegun fire for attacks with rockets and mortars. 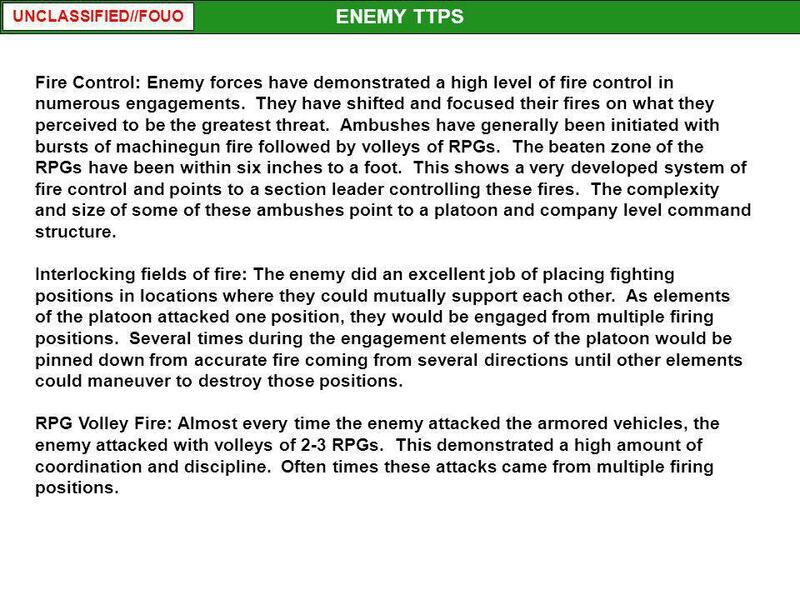 Fire and Maneuver: The enemy proved to be very adept at fire and maneuver. The enemy would fix Marines with RPG and machine gun fire and attempt to maneuver to the flanks. This happened with every engagement. If elements of the platoon were attacked from one direction, they could expect further attacks to come from the flanks. This occurred both with mounted and dismounted elements of the platoon. Anti-Armor Tactics: The enemy did not attempt to penetrate the crew compartment of the vehicles they engaged. They fired volleys of RPGs to the front end of the HMMWVs in order to disable them and start a vehicle fire. Once the crew evacuated, they would engage them with crew served weapons. This demonstrates a very detailed understanding of the limitations of their weapon systems and a thorough knowledge of our armor vulnerabilities. “Karez” Irrigation Ditches: The enemy utilized prepared fighting positions built into irrigation ditches to maneuver about the battlefield and attack the platoon. These ditches ranged from four to seven feet deep and made any frontal attacks very difficult. The enemy would attack from one position and rapidly maneuver to another. This facilitated flanking attacks. The enemy also used tree lines to stage their attacks from. Many wooded areas are bordered with mud walls and irrigation ditches, which the enemy used for cover and concealment. Massing Forces: The enemy was able to mass their forces to over 400 enemy on the battlefield on several occasions. This was not normally the case in Iraq. Situations here in Afghanistan can quickly escalate and even company sized elements can find themselves outnumbered, outmaneuvered and outgunned. The enemy will not always mass but they will rally to defend their leadership or protect their interests. They have conducted ambushes that have swelled to 400 fighter engagements and have also massed to that size to conduct attacks on Forward Operating Bases. Defense in Depth: The enemy plans their defenses with depth and mutual support in mind. 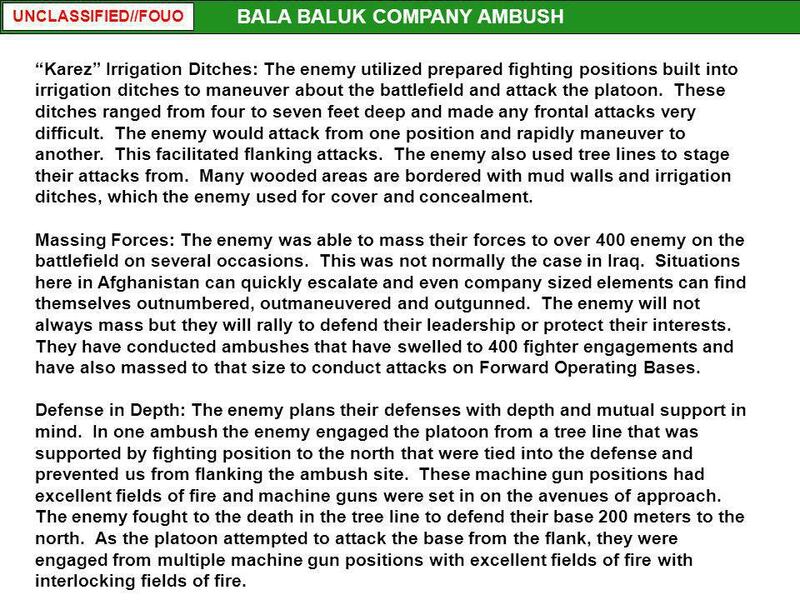 In one ambush the enemy engaged the platoon from a tree line that was supported by fighting position to the north that were tied into the defense and prevented us from flanking the ambush site. These machine gun positions had excellent fields of fire and machine guns were set in on the avenues of approach. The enemy fought to the death in the tree line to defend their base 200 meters to the north. As the platoon attempted to attack the base from the flank, they were engaged from multiple machine gun positions with excellent fields of fire with interlocking fields of fire. 35 LESSONS LEARNED Fire Discipline: Engagements have lasted from two to forty hours of sustained combat. 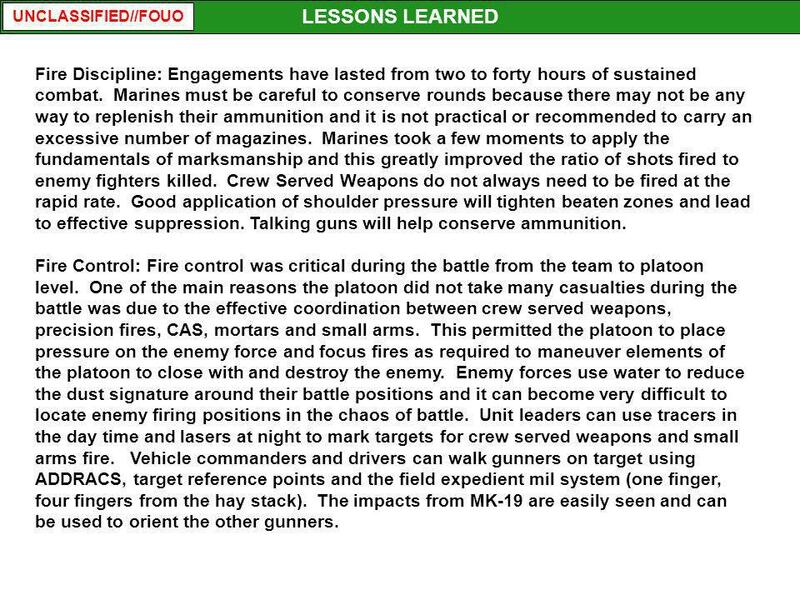 Marines must be careful to conserve rounds because there may not be any way to replenish their ammunition and it is not practical or recommended to carry an excessive number of magazines. Marines took a few moments to apply the fundamentals of marksmanship and this greatly improved the ratio of shots fired to enemy fighters killed. Crew Served Weapons do not always need to be fired at the rapid rate. Good application of shoulder pressure will tighten beaten zones and lead to effective suppression. Talking guns will help conserve ammunition. Fire Control: Fire control was critical during the battle from the team to platoon level. One of the main reasons the platoon did not take many casualties during the battle was due to the effective coordination between crew served weapons, precision fires, CAS, mortars and small arms. This permitted the platoon to place pressure on the enemy force and focus fires as required to maneuver elements of the platoon to close with and destroy the enemy. Enemy forces use water to reduce the dust signature around their battle positions and it can become very difficult to locate enemy firing positions in the chaos of battle. Unit leaders can use tracers in the day time and lasers at night to mark targets for crew served weapons and small arms fire. Vehicle commanders and drivers can walk gunners on target using ADDRACS, target reference points and the field expedient mil system (one finger, four fingers from the hay stack). The impacts from MK-19 are easily seen and can be used to orient the other gunners. 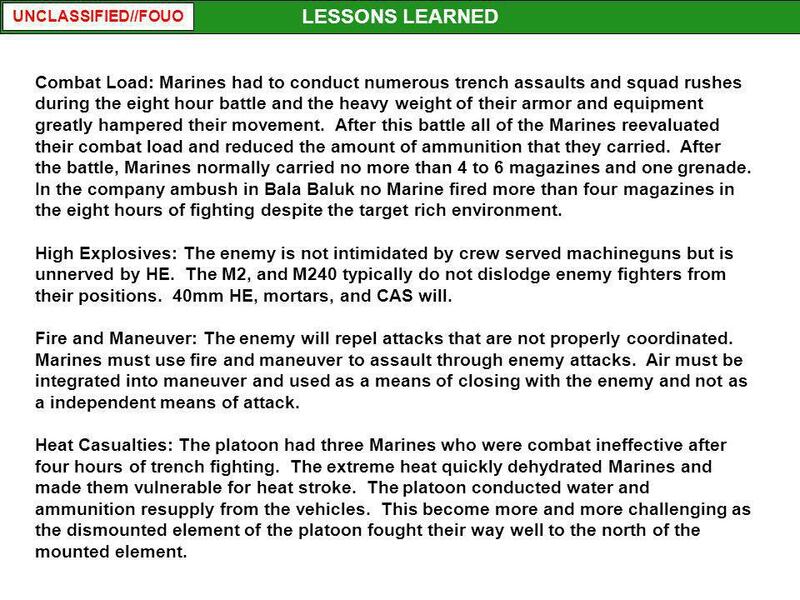 36 LESSONS LEARNED Combat Load: Marines had to conduct numerous trench assaults and squad rushes during the eight hour battle and the heavy weight of their armor and equipment greatly hampered their movement. After this battle all of the Marines reevaluated their combat load and reduced the amount of ammunition that they carried. After the battle, Marines normally carried no more than 4 to 6 magazines and one grenade. 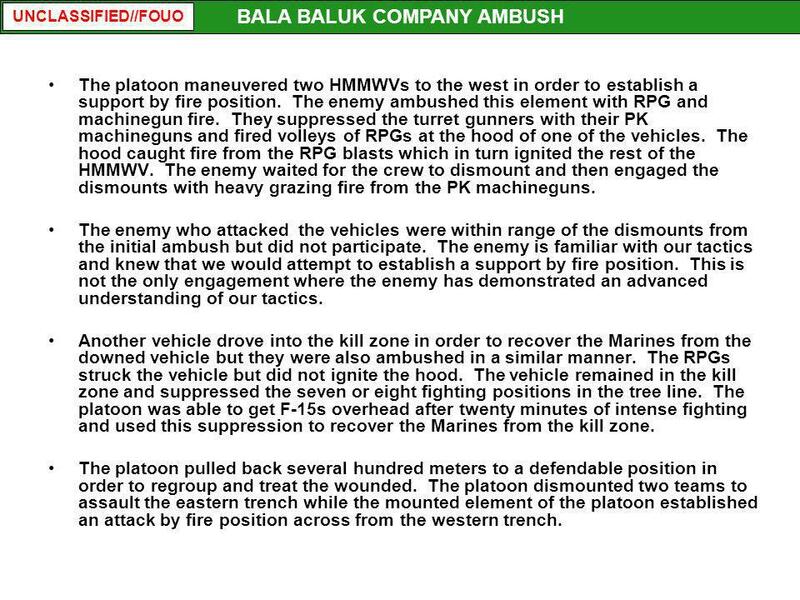 In the company ambush in Bala Baluk no Marine fired more than four magazines in the eight hours of fighting despite the target rich environment. High Explosives: The enemy is not intimidated by crew served machineguns but is unnerved by HE. The M2, and M240 typically do not dislodge enemy fighters from their positions. 40mm HE, mortars, and CAS will. Fire and Maneuver: The enemy will repel attacks that are not properly coordinated. Marines must use fire and maneuver to assault through enemy attacks. Air must be integrated into maneuver and used as a means of closing with the enemy and not as a independent means of attack. Heat Casualties: The platoon had three Marines who were combat ineffective after four hours of trench fighting. The extreme heat quickly dehydrated Marines and made them vulnerable for heat stroke. The platoon conducted water and ammunition resupply from the vehicles. This become more and more challenging as the dismounted element of the platoon fought their way well to the north of the mounted element. 37 LESSONS LEARNED Contingency Planning: A platoon should conduct every operation with a plan how to medevac wounded personnel, conduct an emergency combat resupply, and link up with reinforcements. During the course of this deployment our platoon has had to deal with all of these scenarios. Having a plan that had been rehearsed prior to the attack made it easier for the platoon to deal with these situations. 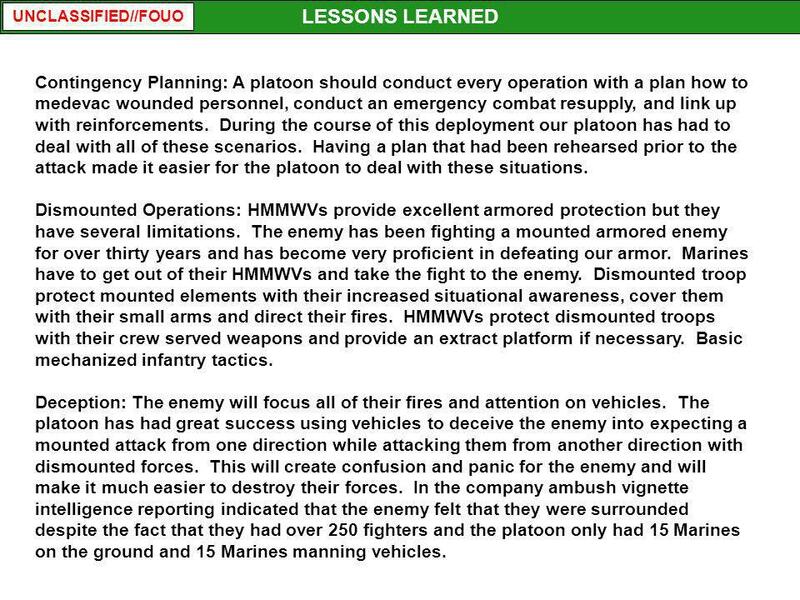 Dismounted Operations: HMMWVs provide excellent armored protection but they have several limitations. The enemy has been fighting a mounted armored enemy for over thirty years and has become very proficient in defeating our armor. Marines have to get out of their HMMWVs and take the fight to the enemy. Dismounted troop protect mounted elements with their increased situational awareness, cover them with their small arms and direct their fires. HMMWVs protect dismounted troops with their crew served weapons and provide an extract platform if necessary. Basic mechanized infantry tactics. Deception: The enemy will focus all of their fires and attention on vehicles. The platoon has had great success using vehicles to deceive the enemy into expecting a mounted attack from one direction while attacking them from another direction with dismounted forces. This will create confusion and panic for the enemy and will make it much easier to destroy their forces. 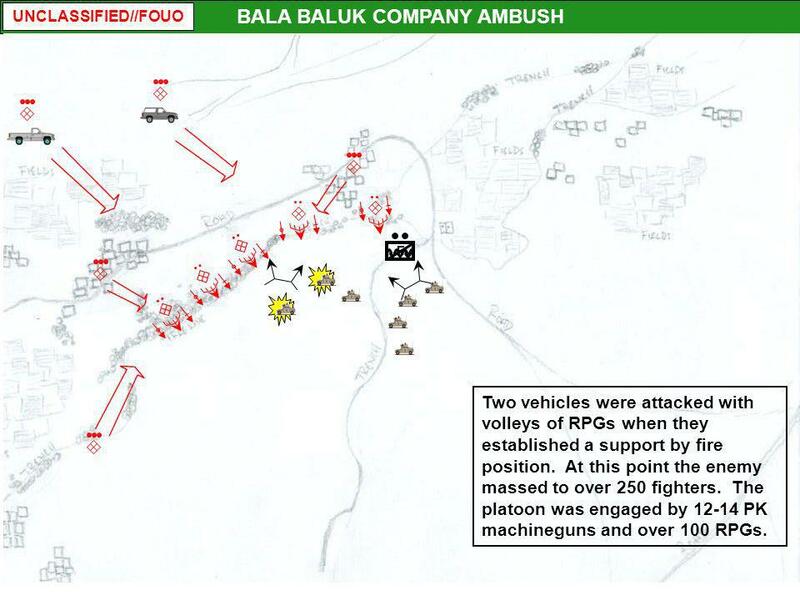 In the company ambush vignette intelligence reporting indicated that the enemy felt that they were surrounded despite the fact that they had over 250 fighters and the platoon only had 15 Marines on the ground and 15 Marines manning vehicles. 38 BOTTOM LINE Fundamentals: The basic skills and tasks taught at SOI and TBS will carry the day as they are based on hard lessons learned by Marines who have gone before us. 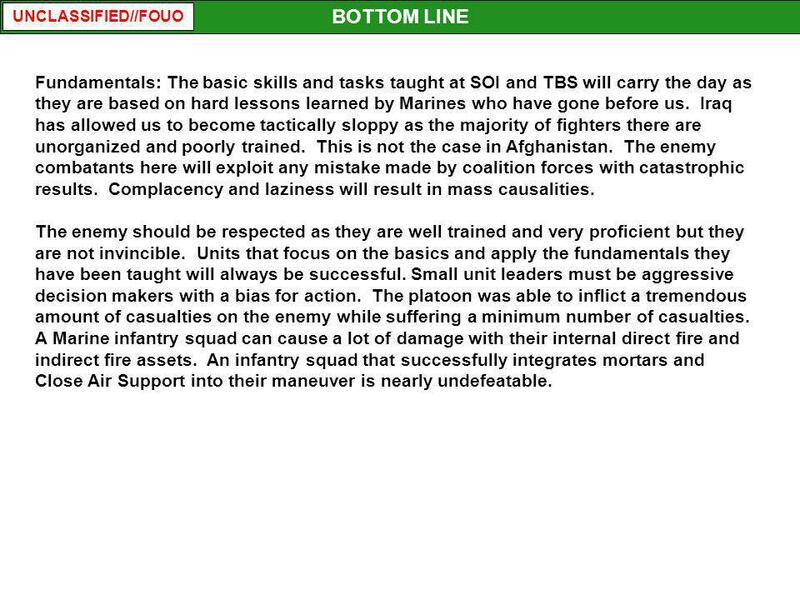 Iraq has allowed us to become tactically sloppy as the majority of fighters there are unorganized and poorly trained. This is not the case in Afghanistan. The enemy combatants here will exploit any mistake made by coalition forces with catastrophic results. Complacency and laziness will result in mass causalities. The enemy should be respected as they are well trained and very proficient but they are not invincible. Units that focus on the basics and apply the fundamentals they have been taught will always be successful. Small unit leaders must be aggressive decision makers with a bias for action. The platoon was able to inflict a tremendous amount of casualties on the enemy while suffering a minimum number of casualties. A Marine infantry squad can cause a lot of damage with their internal direct fire and indirect fire assets. An infantry squad that successfully integrates mortars and Close Air Support into their maneuver is nearly undefeatable. 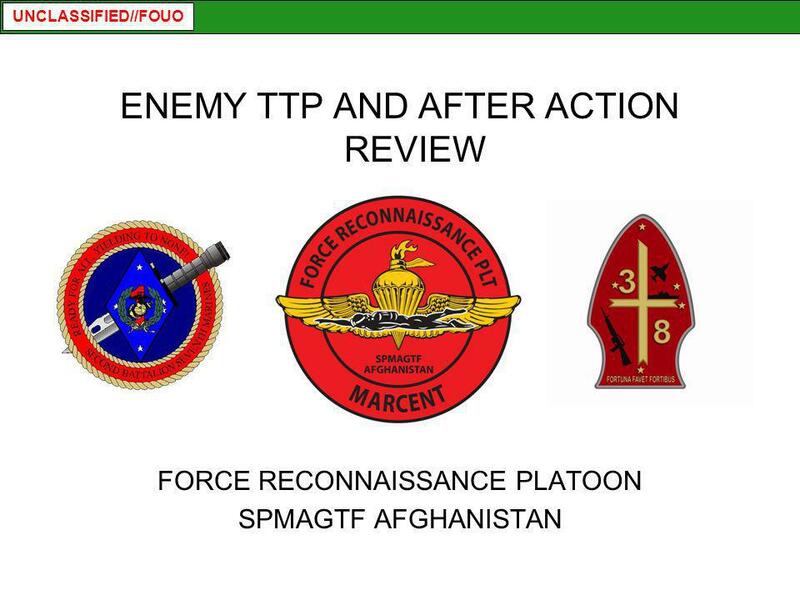 Download ppt "ENEMY TTP AND AFTER ACTION REVIEW"
A Bloody Conflict. Germanys Plan Fails Germany had long been prepared for war against France and Russia. It immediately launched a massive invasion of. REFERENCES FM 7-8, Infantry Rifle Platoon & Squad. METT-T CAPT MULVANEY. MISSION What is required by the tactical task given to you? Convoy Operations and TTPs Lessons Learned. Threat Unconventional (Irregular) Forces 1-2% of the Population Cannot identify until they attack They want. Tactical SUT. 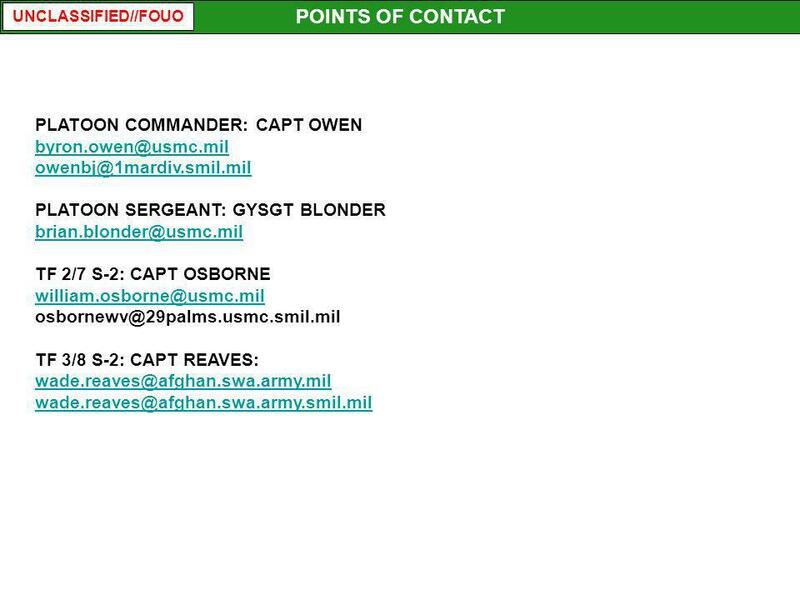 Overview Terms How to move as an individual (patrol/contact) How to move in a Team (patrol/contact) Ambush. Battle Hard! The Red Zone Fight Centurion OPD Battle Hard! AGENDA References Pretest Review Definitions Introduction NTC Trends Success in the Red Zone. Squad in the Offensive By SSgt Scarfe. Order of Events Class room instruction Walk through / Rehearsals. Fighting Positions REF FM 7-7 THE MECHANIZED INFANTRY PLATOON AND SQUAD (APC) SSG Christian J. Behr 1st Squad Leader Det 1, 169th MP Co.
Reconnaissance and Surveillance Leader Course OPFOR TTP.